Who’s the oldest major-leaguer you saw play? I passed along to my father Al Yellon’s article at Bleeding Cubbie Blue on Lennie Merullo, the last living Cub to play in a World Series (an event, as I’ve mentioned many times, that Dad attended as a 10-year-old in 1945). I hadn’t recalled Grandma Sue talking about too many old-timers beside Carl Hubbell, whom she had very specific memories of, but Dad corrected me when I said she telescoped on Hubbell. “She was but was also able to talk knowledgeably about Ruth, Gehrig, McGraw and even Mathewson,” he said. It got me thinking about who is the oldest ballplayer I could speak to having seen play. Since my earliest baseball memory is of Hank Aaron’s 715th home run, I’d probably have to start there. Aaron was born in 1934, was 40 when I first recall seeing him and is 79 years old now. I remember when Frank Robinson became a player-manager of the Cleveland Indians, but Robinson was more than a year younger than Aaron. As for the oldest Dodger I ever saw, I have to discount Robinson, who was with the Dodgers in 1972, before I began paying attention to them. Instead, I’ll happily settle for 1977 pinch-hitting playoff hero Vic Davalillo (b. 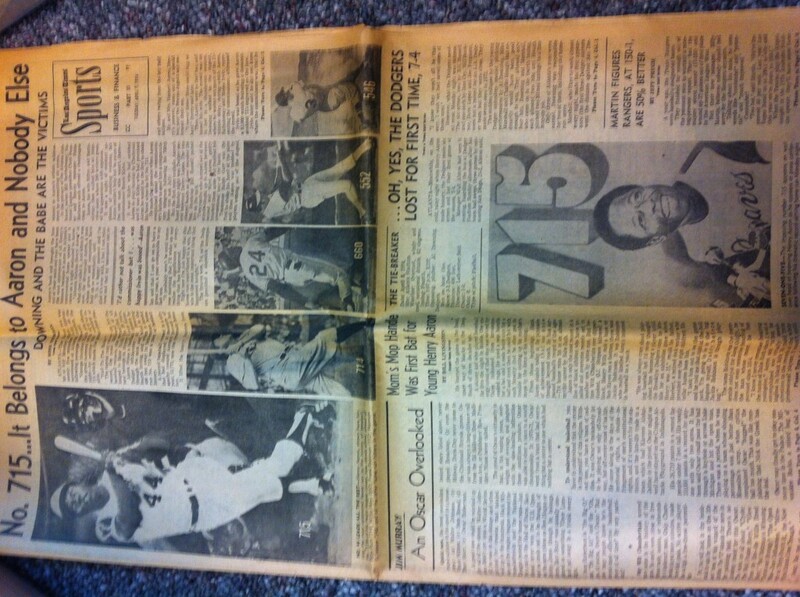 1936), followed by the one and only Manny Mota (b. 1938). 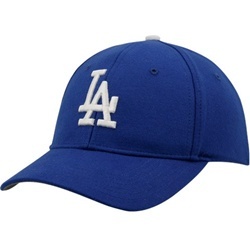 Twice within 10 minutes at the market today, fellow shoppers saw me in my Dodgers cap and volunteered cheerful expressions of hope for next season. That’s never happened to me before. Well, folks, we sure got a humbling wakeup call about our understanding of the Dodgers this week. For starters, all season long, everyone — and I mean everyone that wrote, commented, tweeted or otherwise published a word about the 2013 Dodgers — attributed in-game strategic decisions wholly to manager Don Mattingly. Then, this week, all of a sudden there was Trey Hillman. Sure, the bench coach had been there all along, been there for three years, but he had walked the Dodger planet in almost complete anonymity, save for taking over after a rare Mattingly ejection. Hardly a word was uttered about his role with the team until Monday, when he was fired for whatever advice he did or didn’t give, day after day, to Mattingly. Even today, no one seems entirely clear what that counsel was or wasn’t. Mattingly was the guy in the driver’s seat, of course. The in-game buck stopped with him. But now we’re told that the bench coach played a much more significant role with the Dodgers than anyone realized. There was this nearly invisible x factor that reminds all of us that as much as we think we know everything that’s going on with the team, we still operate in large pockets of complete ignorance. 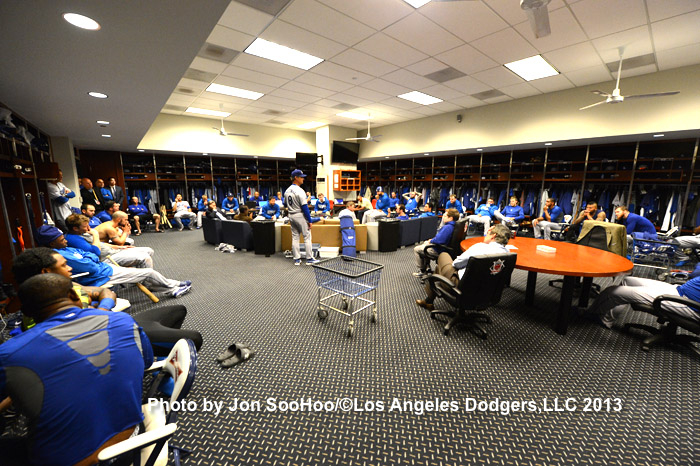 On top of that, a new mystery about what exactly the Dodger clubhouse was like in 2013 emerged Monday, via the infamous Mattingly-Ned Colletti press conference. I made the point, on Twitter I believe, that this seemed to be the most peaceful Dodger clubhouse in my memory — certainly in my time doing Dodger Thoughts. Outside of roughly 24 hours worth of quickly defused tension between Mattingly and Andre Ethier and whatever wrassling might have been going on with Yasiel Puig, there was no hint of conflict reported by the media. But on Monday, Mattingly opened a small window into what may actually be a large world of in-house second-guessing and authority-undermining, the extent of which still isn’t clear. Whatever it is, it was not a part of the published story of the 2013 Dodgers until after the 2013 Dodgers were history. … while I think Andre Ethier was clearly in mind as Mattingly spoke about what it takes to win and all that, I don’t think Mattingly was singling out Ethier. I think he was making an example of Ethier, which is an entirely different thing. Ultimately, Mattingly seemed at peace with the responsibility of being the fall guy. But clearly, he was wrestling with other feelings that emerged this week, and even more clearly, not everyone was on the same page when Monday’s press conference was called. 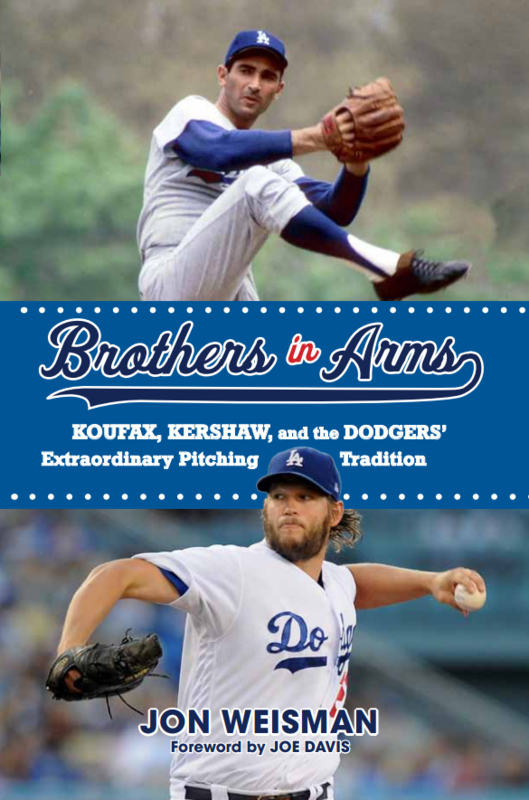 Perhaps rather than the epilogue of the 2013 season, what Monday brought us was the first page of the book on the 2014 Dodgers. As for head trainer Sue Falsone’s departure (once more, the Variety term “ankling” seems useful here), it was celebrated by numerous fans who weren’t in thrall to her or her pioneering position in the guys’ club. But our ignorance about the impact of her presence or absence could hardly be higher. Few inside the organization, and fewer still outside of it, have any idea how Falsone, Stan Conte or anyone on the Dodger medical staff improved or diminished the team’s overall health — that is, on the injuries they actually might have had any influence upon. There was undeniable inevitability of injuries to middle-age players like Chris Capuano, Carl Crawford or Mark Ellis, while putting mishaps like Zack Greinke’s broken collarbone on the staff’s plate is particularly ludicrous. Logically, the only question is not whether the 2013 medical staff wasn’t good, but whether anyone could do better. That’s a much different way of framing things than assuming they were actually contributing to the Dodger injury problems, which I’ve seen some fans posit. Look, I’m not above questioning things that the Dodgers do, from player transactions to bunting decisions to the presence of in-stadium pregame hosts. Not only is that part of following the team, but sometimes, I think outsiders really do know better. But be wary of having too swollen a head about this stuff. There’s lots going on beneath the surface that we don’t know about until much, much later. The Dodger managerial career of Walter Alston began when he was hired in the 1953-54 offseason on the first of 23 one-year contracts to replace Charlie Dressen, who had legendarily requested a multiyear deal after winning the National League pennant with 105 victories but was then shown the door. Judging by tweets from today’s (by numerous accounts) tensely uncomfortable Dodger press conference involving Don Mattingly and Ned Colletti, Mattingly was unhappy that it was so easy to view him as a lame duck and is testing the same path. Put another way, Mattingly may have decided to sacrifice his current managerial job to move his future to the next base. Don Mattingly said his 2014 option vested when the Dodgers beat Atlanta, but "it doesn't mean I'll be back"
Mattingly: "I love it here, but I don't want to be anywhere I'm not wanted." However, Mattingly wouldn't say he would be back for sure. Didn't like being a lame duck this year. Third-base coach Tim Wallach, by the way, is considered a top MLB managerial candidate by several observers. So aside from looking outside the organization, there remains at least one in-house alternative, should Mattingly and the Dodgers part ways. Likely settling one of their major questions for 2014, the Dodgers appear to have signed — after more than one false start — infielder Alexander Guerrero to a four-year deal worth at least $28 million, according to Jesse Sanchez of MLB.com. The 26-year-old Guerrero, who defected from Cuba earlier this year and can earn an additional $4 million in incentives, is a good bet to play second base and figures to be a step up offensively over Mark Ellis, according to Mike Petriello of Mike Scioscia’s Tragic Illness. Ellis, who has a $5.75 million club option or a $1 million buyout, has probably played his last game as a Dodger, though he could conceivably return on a lower salary as a backup and mentor to Guerrero. 1) What happens to half the infield? Juan Uribe is a free agent, while Mark Ellis has a $5.75 million club option or a $1 million buyout. Signing a major bat for second base might make it more comfortable for the Dodgers to bring back Uribe (at a paycut) for his defense. If not Robinson Cano, then Alexander Guerrero? If not Guerrero, then whom? 2) What happens with the outfielders? You say it’s one too many, but the medical reports indicate otherwise. Remember the illusion of this year’s starting pitcher surplus. There’s little reason to give one away on a salary dump, and little more reason to think the Dodgers can get top value for any of those they would even consider trading before they prove themselves healthy. So whither the quartet? Does minor-leaguer Joc Pederson step into a major-league role or become trade bait? 3) What happens with the starting pitching? Clayton Kershaw, Zack Greinke and Hyun-Jin Ryu are locks, but what about the other spots? Ricky Nolasco and Edinson Volquez will likely be free agents, and Chris Capuano will be bought out for $1 million. Chad Billingsley and Josh Beckett will be coming back from major injuries. If past patterns are any indication, the earliest arrival for Zack Lee from the minors will be May. That’s a lot of gray area in next year’s rotation. Bet the over on David Price trade rumors. Oh, I had big dreams about this Dodger team today. And what fueled those dreams was how resilient the 2013 Dodgers were and the heights they were able to reach. The truly fun Dodger teams are the ones you can never count out – the teams that could make comebacks something you not only hoped for, but nearly expected. Moving from last place to first in such spectacular fashion this summer, peaking with that 42-8 run that made time travel seem possible, had the effect of a Cupid’s arrow in my baseball-toughened heart. There would be no easy surrender. 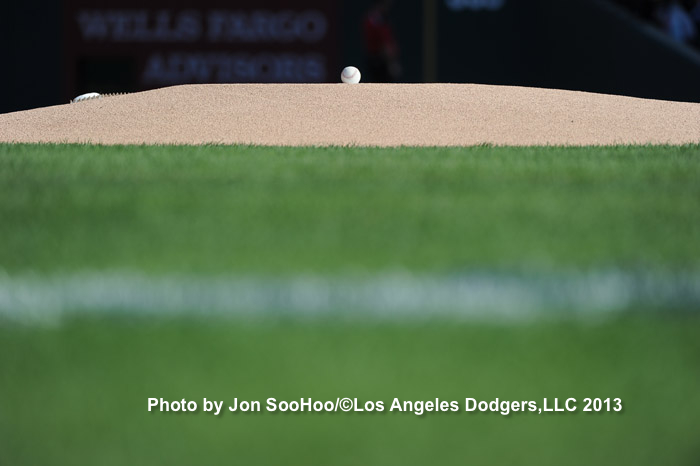 It was what allowed me to believe as the final wave of injuries swallowed up Matt Kemp, Andre Ethier and Hanley Ramirez, what allowed me to believe as the Dodgers faced three consecutive winner-take-all games. 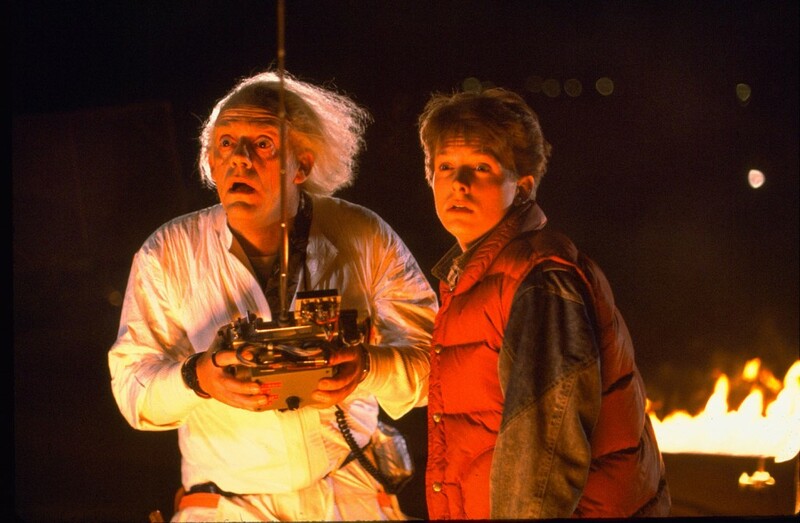 That, and the proof from 1988 that the improbable could come to life. To say the least, tonight’s season finale, a 9-0 loss in Game 6 of the National League Championship Series, did not do those dreams justice. 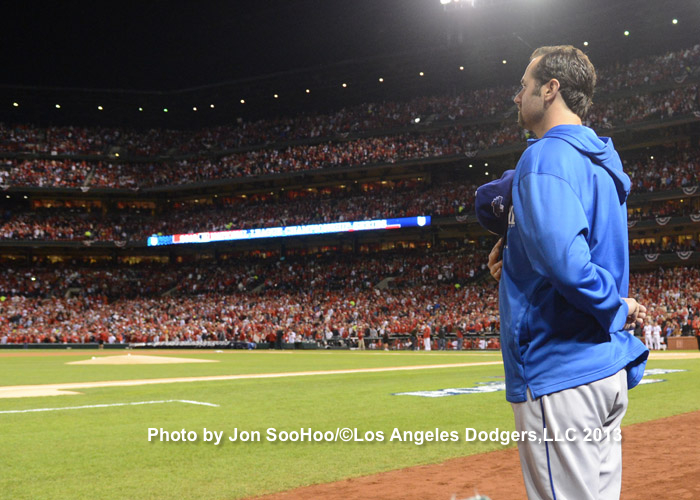 Clayton Kershaw was on one end of the universe, and Michael Wacha was on the other. I was so prepared for a virtual repeat of Game 2’s vice grip on my nerves, but my vision just evaporated. One of baseball’s eternal questions is whether it’s better to go down in bitterly close defeat or with a giant thud. I think this time, I’ll take the thud. But as time passes, it all blends together anyway, becoming yet another tally on our endless journey through the desert. This has been the Dodgers’ biggest step in the past 25 years, but we still wonder how many more we’ll have to take. I liked this team. I liked these guys, without exception. I would list them all, but I would just be listing the entire roster. (OK, I don’t really get Brian Wilson, but he sure joined in without a hitch.) This was as easy a Dodger team to root for as any. However much you might be hurting, think of them. But also, feel free to revel in your community of fellow fans. Man, that conversation about which organization was superior or which fans were better was as dumb as it gets. Never cared about being "the best fans in baseball." Just wanted my team to be the best. Love baseball, but fandom is not a competition. Never expected anyone else to enjoy baseball on my terms. Don't understand fans who judge those who aren't like them. As long as you're not hurting anyone else — which is inexcusable — why should anyone care what kind of fan you are? This was a different kind of year blogging about the team for me. I stayed on hiatus almost the entire offseason and didn’t even decide to resume more regular efforts until the day before the regular season began. And even then, my work was less dedicated than it had been, as I repeatedly questioned how much time I should devote to it. I felt a bit like an old man at the blogging game. I felt I could still reach some heights, but I was picking my spots. I took my rest. As the season went on, however, these 2013 Dodgers energized me. They were in my head, and they got much more out of me than I would have expected. They reminded me that in some ways, this still feels like my calling. For those who came back around, thanks for reading. And let’s get these guys healthy and plug those holes and go get that World Series next year. If it’s any consolation to Clayton Kershaw in the short term, it does not appear there was any besting Michael Wacha tonight. While Kershaw unraveled, allowing four runs in the third inning and three more in the fifth in his worst performance in 15 months, Wacha dominated Los Angeles for the second time in the National League Championship Series. Wacha, the youngblood compared with Kershaw, faced only two batters over the minimum in allowing no runs and three baserunners in seven shutout innings, needing only 95 pitches in the process. Only one Dodger advanced past first base and none past second before Wacha was removed with St. Louis comfortably ahead, 9-0, as this post was being written. Tonight was ugly, but also numbing. Nothing about it eases the pain of how close the Dodgers came to winning Games 1 and 2 of the NLCS. Nothing short of an absolute, unconscious miracle in the final minutes. The Dodgers and their fans weren’t having a nightmare. It really happened. Kershaw had a stressful second inning, when he gave up a single to first-time postseason starter Shane Robinson, who previously hurt the Dodgers with a pinch-hit homer in Game 4. Kershaw threw two wild pitches to allow Robinson to advance to third, and only struck out No. 8 hitter Pete Kozma on a 3-2 fastball that was above the strike zone. With one out after retiring opposing pitcher Michael Wacha, Kershaw could not put Matt Carpenter away. The Cardinal second baseman took ball one, then fouled off seven pitches in a row. It’s the ability to put away a hitter that helps separate Kershaw from other pitchers, but it was nowhere to be found in this at-bat. After ball two arrived, Carpenter fouled off another pitch, then drilled a no-doubt double to right field on the 11th pitch of the at-bat. Kershaw fell behind 2-1 in the count to Carlos Beltran, then gave up a solid single to right field that scored the game’s first run. Yasiel Puig’s off-balance throw was dropped in the middle of the diamond by Adrian Gonzalez, eliminating any chance the Dodgers had of throwing Beltran out trying to advance to second base. Kershaw’s next five pitches were strikes – three to fan Matt Holliday (the final one looking) and then two more to Yadier Molina, to put him within a strike of escaping the inning down by only a run. But the next two pitches missed badly, and then Kershaw came in with a hanging, shoulder-high pitch that Molina lashed up the middle for the second run of the game. David Freese came to the plate with Kershaw having thrown 27 pitches in the inning already. The first pitch was strike-worthy but called a ball, the second was way high and the third was fouled off. The next pitch stayed up and was grounded between Kershaw’s legs and up the middle to put runners on first and second. Matt Adams, 3 for 20 in the NLCS, swung and missed at a 1-1 pitch, and once again Kershaw was one strike away from escaping with reasonable damage. But then, the 1-2 pitch just missed – Kershaw wanted that one – the 2-2 pitch was a bit outside and the 3-2 pitch was a hair low, angering Kershaw even more. Home plate Greg Gibson certainly did Kershaw no favors in this at-bat. Robinson took a called first strike that was no worse than the two key balls called for Adams. But the next pitch – the 39th of the inning – was a fastball in the middle of the plate that drove home two runs and emphatically made the bottom of the third a disaster for Kershaw and the Dodgers. Puig’s throw home was wild, allowing the runners to advance to second and third, but the damage was already done. Kozma was walked intentionally, bringing the inning’s leadoff hitter, Wacha, back to the plate. By this time, no hitter could be considered an easy one for Kershaw. Wacha took ball one, then fouled off three pitches before taking a called third strike on the 48th pitch from Kershaw in the bottom of the third. The TBS announcers were like wild animals in on the kill going after Puig for his two shaky throws, and though he didn’t help the Dodgers, neither play really mattered on a night that Kershaw, at the worst possible moment, just didn’t have it. Robinson, in his first start of the series, beat the upcoming Cy Young winner in consecutive innings. Carpenter had the at-bat of the game in putting Kershaw on the ropes. Molina came off the hook after being behind 0-2 in the count. You can blame Adams’ walk on the umpire if that makes you feel better, but the bottom line is that Kershaw had three other chances to minimize the damage against him in the bottom of the third, and he couldn’t convert any of them. He couldn’t catch a break, but except for Holliday, he didn’t make his own breaks either. It was an inning that was in such contrast to Kershaw’s performance this year and our expectations for him tonight. But our hero was human. For the Dodgers’ first official Game 6 since October 11, 1988, I’m quivering. At least 52 batters will come to the plate tonight, and any one of them could decide the fate of the evening .. and beyond. We could be witnesses to history, or infamy. World Series tickets go on sale Saturday, unless they don’t. Hanley Ramirez’s absence from the starting lineup will hurt the Dodgers, unless it doesn’t. Winter is coming, unless it’s not. I can’t help think that all these games are tests of fortune, not of strength. The line between greatness and mediocrity, between glory and ignominy, is way too thin for us to invest so much meaning into. And yet, we do. How good will it feel if we keep this going? No words. Dodgers at Cardinals, 5:37 p.m.
Update: Hanley Ramirez is a last-minute insertion into the starting lineup, batting fourth. Yasiel Puig drops below Ethier to sixth and pushes down Juan Uribe and A.J. Ellis. They have Clayton Kershaw going Friday in Game 6. If they win, they’ll have Hyun-Jin Ryu, who preyed upon the Cardinals’ weakness against lefties, going Saturday in Game 7. There were good signs in Game 5, but those came largely against pitchers the Dodgers won’t see again in this series. The challenge going forward for the offense rises to a different level. Can they hit? Will they score? Down three games to one in the National League Championship Series, with the bases loaded and nobody out in the top of the first and the tying runs on base in the ninth, the Dodgers weathered their most worrisome storm of 2013 and then some, hitting four home runs to back Zack Greinke and earn a return trip to St. Louis with a 6-4 victory. Clayton Kershaw will start Game 6 for Los Angeles on Friday against the Cardinals’ Michael Wacha, in a rematch of their Game 2 showdown won by Wacha, 1-0. Should the Dodgers survive, it would be Hyun-Jin Ryu and everyone else on the staff against Adam Wainwright and friends in Game 7 on Saturday. Greinke had a most eventful first three innings, driving in the Dodgers’ second run of the second inning for a 2-0 lead, but allowing two runs of his own in the third. 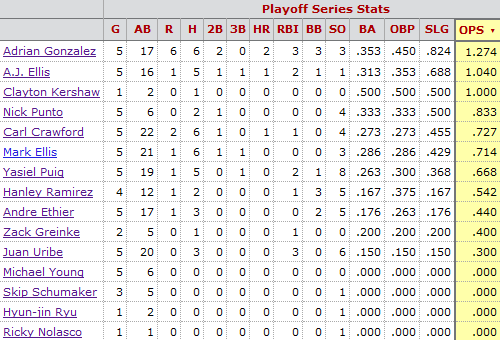 Seven of the first 13 St. Louis hitters in the game reached base against the Dodger right-hander. 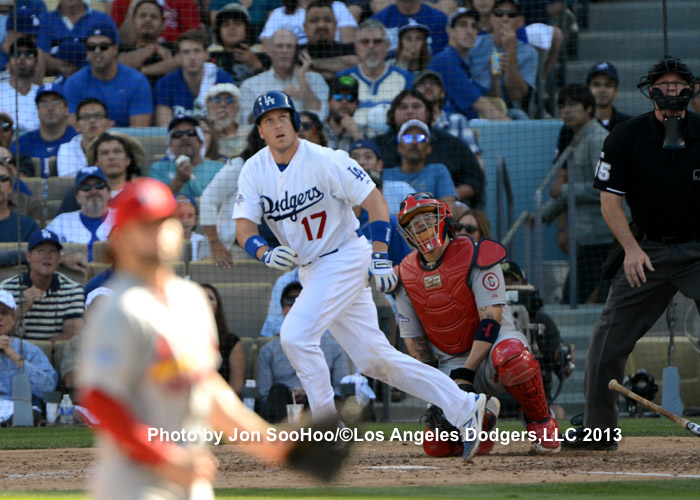 But after Yadier Molina hit into his second double play to end the top of the third, Greinke went on to retire the next 12 batters, while the Dodgers took control behind solo home runs by Adrian Gonzalez, Carl Crawford and A.J. Ellis. 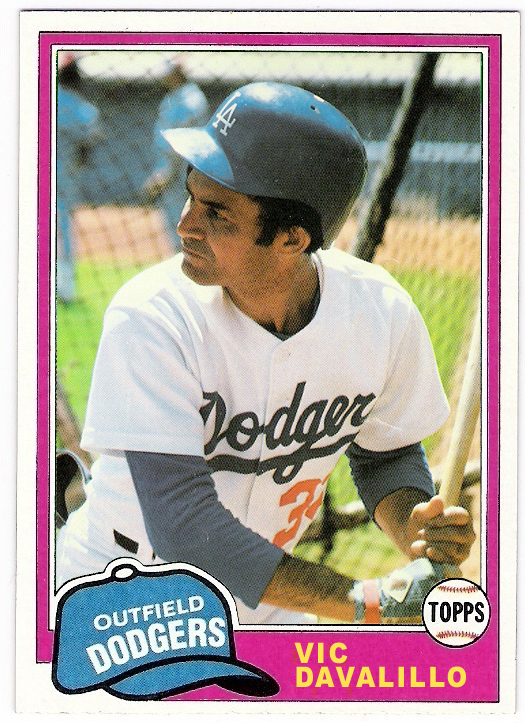 Following a shutout eighth by Brian Wilson, Gonzalez hit his second home run of the game to give the Dodgers a four-run lead. After hitting no home runs in the first 42 innings of the series, Los Angeles hit four homers in the next six innings. The Dodgers had not hit four home runs in a playoff game since 1978. St. Louis scored two runs in the ninth, fueled by a sun double in front of Yasiel Puig in right field. Singles by Matt Adams, John Jay and Pete Kozma soon followed, but Kenley Jansen closed the door on the potential devastation by striking out Adron Chambers. In a repeat of Tuesday’s Game 4, Hanley Ramirez once again started but had to leave the game in the top of the seventh inning after going 0 for 3. He’ll have about 48 hours off before he has to take the field again. Cardinals at Dodgers, 1:07 p.m. When I went to the Dodgers’ National League Division Series clinching game last week, the Dodger Stadium crowd seemed to be brimming with optimism. Then Monday night, in Game 3 of the National League Championship Series, the crowd was throaty with desperation. Both were really loud. Tonight at Dodger Stadium, the crowd seemed much more wary and tense than either of those two games. It wasn’t a must-win game, but it also wasn’t exactly a house money game. And that made things not quiet, but a touch more subdued. In reality, this game and the last one I went to against Atlanta were much the same experience — a promising beginning followed by slow, painful torture through the middle innings, and then a moment of hope in the Dodgers’ final at-bat. But the biggest difference of all was that there was no two-run home run to save the day, no echo of Juan Uribe from the previous week or Kirk Gibson from 25 years earlier. The Dodgers need to win three games in a row over the next four days to reach the World Series and avoid elimination. They can do it, and I hope fans realize it. Odds are they won’t — odds are that St. Louis can win one out of three games. But having a fully rested Zack Greinke, Clayton Kershaw, Hyun-Jin Ryu and Kenley Jansen over those final three games is as much as you could hope for from your pitching staff (although we might well have seen the last of Hanley Ramirez, who had to leave tonight’s game after six innings, for a while). It’s worth keeping the flame burning. I am curious what Wednesday’s crowd will be like. Many people who bought tickets for NLCS Game 5 probably didn’t anticipate it would take place during the day — that plus disillusionment will probably keep Dodger Stadium from being a packed house. In any case, the Dodger season has had enough twists and turns — there’s no benefit in assuming there won’t be any more. Cardinals at Dodgers, 5:07 p.m.